WarcraftPets Turns 6, Celebrating Six Great Years! 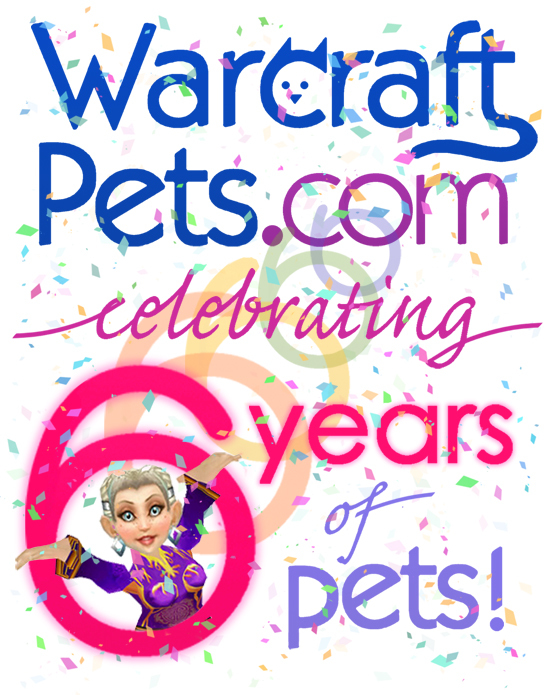 It's been six years since the launch of WarcraftPets, and today we're celebrating our 6th anniversary and six wonderful years of pets! Through the many years we've evolved so much, and we thank you for continuing to support us. Thanks to your contributions, our community has grown and become a great resource for pet lovers, both collectors and battlers alike. The past year has been a whirlwind of new additions, features, and of course, many new pets! Over 300 new pets added to our database. WarcraftPets received a fresh new look just in time for the release of MoP. WarcraftPets Forums opened up for even more pet discussion. New guides, including our Guide to Pet Battles and Guide to Pet Breeds. Extensive new pet filters and our battle stat calculator were implemented to make finding the perfect pet easier. Breanni had the pleasure of interviewing Lead Content Designer, Cory "Mumper" Stockton... twice! Improved collection tracking with details and in-depth stats for your pet collection. Pet Scores replaced our traditional collection ranking system, and the Top 50 collections became the Top 500, showcasing many more amazing collections. We had a huge giveaway prize, Mini Tyrael, in the Pet Tips for Mini Tyrael Contest. And just recently, another hilarious April Fool's prank... waka, waka! We'd like to thank everyone again, especially our Site MVPs, for continuing to support WarcraftPets. We wouldn't be here without you.